I'm addicted! I know everyone is. Facebookers I mean. 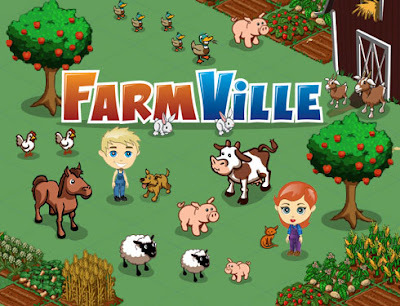 At first, I thought Farmville was the lamest game anyone was ever hooked to. But my friends were so addicted that I had to know what it was all about. I regreted rejecting anything that came from the application. It's a very complicated game and needs time to be adjusted to and get to learn the ropes. The aim of the game I guess, is to learn how to collect money (make profit) and use it wisely for future expansion. Its like I'm racing my friends to the end. I'm glad I just have 3 people ahead of me, thats a big leap from the 12 who were when I first started. In three weeks I'm on level 24 and the game will continue until God knows when. 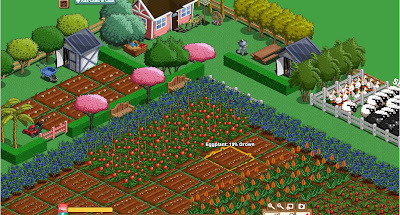 Basically you grow fruits and vegetables and raise animals on your very own farm! You also buy your own buildings and decorations throughout the game. My addiction got so bad that I found myself waking up at midnight just to check if my crops were still alive! Thats psycho! What more, when I go to a friend's house, I race to their PC to check on my farm! Its hillarious, my friends still tease me about it. I feel too old for this but I'm really enjoying the break from my usual daily activities. If you still haven't played it, then I order you to;p Especially if you're working in the office and have extra time this will make time fly by so fast! If you study then forget you ever read this post.